Coakley, J.p. and M.n. Charlton. "Lake Erie". The Canadian Encyclopedia, 25 January 2018, Historica Canada. https://www.thecanadianencyclopedia.ca/en/article/erie-lake. Accessed 20 April 2019. The lake drainage basin measures 58 800 km2 in area, and is home to over 15 million people in Canada and the US, making it the most densely populated of all the Great Lakes basins. 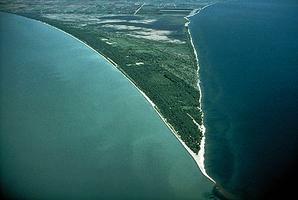 Point Pelee National Park, Ontario, is located on the crossroads of two major migration flyways (photo by J.A. Kraulis). Aerial view of the park from south to north (photo by C. Lemeiux). Lake Erie, 25 700 km2 (including islands), of which 12 800 km2 lie in Canada, elevation 173.3 m; 388 km long, 92 km wide and 64 m deep. The shallowest of the 5 major GREAT LAKES (excluding Lake St Clair), it receives most of its waters from Lake HURON via the DETROIT R. Other major inflowing streams are the Maumee and Cuyahoga rivers in Ohio, and the Grand River in Ontario. 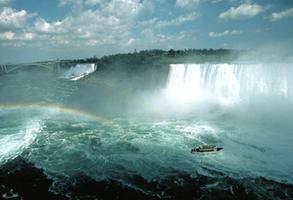 The lake outflows through the NIAGARA R at FORT ERIE, falling almost 100 m to Lake Ontario; more than 50 m of this drop occurs at NIAGARA FALLS. It is also joined to Lake Ontario by the WELLAND CANAL. The lake drainage basin measures 58 800 km2 in area, and is home to over 15 million people in Canada and the US, making it the most densely populated of all the Great Lakes basins. Buffalo, New York; Erie, Pennsylvania; Toledo and Cleveland, Ohio, are large, heavily industrialized cities on the US side. NANTICOKE is the only sizable community on the Canadian shore. Lake Erie is the southernmost of the Great Lakes (latitude similar to northern California), and this, combined with its relatively shallow depth and large nutrient inflows from the urban areas and intensively cultivated farmlands making up its watershed, contributes to a high level of biological productivity. Excessive productivity caused the proliferation of unsightly algae, which later sank and decomposed during the summer. This decomposition caused the thin, cold, lower layer of water (hypolmnion) to be devoid of oxygen. Phosphorus loading controls agreed upon by Canada and the US in 1972 and 1978 have gradually resulted in lower nutrient levels. By 1987 the offshore waters were now quite clear in the summer, with visibility of up to 8 m. The response of oxygen conditions is being closely monitored. 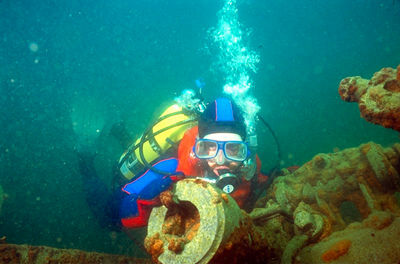 Despite pollution and LAMPREY infestations, the lake supports the largest commercial fishery in the Great Lakes, yielding more than 20 000 t annually, consisting mainly of yellow perch. Warm summers, excellent beaches and well-preserved coastal marshes make Erie a favourite rendezvous for summer recreationists and wildlife enthusiasts (seePOINT PELÉE NATIONAL PARK). Bird-watchers flock to these areas to take advantage of the lake's position on the major migration routes. Although Erie freezes over most winters, it remains an important part of the ST LAWRENCE SEAWAY system. Like most of the other Great Lakes, Erie occupies a glacier-deepened river drainage system in which the less resistant shales and limestones of the Palaeozoic rock column were differentially eroded to create the huge elongated depressions in which the lakes formed. These Pleistocene glaciers, hundreds of metres thick, periodically occupied much of the basin and left behind extensive deposits of clay and silt, which now comprise much of the rapidly eroding shoreline. More resistant dolomites form the shoreline only in the extreme eastern and western portions of the lake. The north shore was frequented intermittently by NEUTRAL native peoples who lived around the Niagara Peninsula and along the Niagara Escarpment. Étienne BRÛLÉ (c 1592-1633) was likely the first European to sight the lake. The decisive naval battle at PUT-IN-BAY was fought on the lake during the War of 1812. Called Lac du Chat by the French explorers, the lake came to be called after the Erie, an Iroquoian tribe inhabiting the south shore.